Fall is rapidly approaching and that means one thing (well, other than the start of classes): Sweaters! I am having massive sweater cravings. The exact nature of these cravings will be for another post, though, because right now I am in need of some knitterly counsel. I am wanting to knit sweaters. Knit! Create! Positive feelings! Why then, am I also contemplating sweater murder? That is, of course, the infamous Rogue, and also the Hourglass Sweater making its blog debut. And I suppose I should clarify that I am not so much interested in committing murder as in facilitating reincarnation. Through a combination of insufficient attention to gauge, normal stretching, and some weight loss, both sweaters are too big. They were both a bit big to begin with, but now they’re really too big. I have a 34″ bust. The sweaters have 40″ and 39″ busts, respectively. I want to rip them both out and re-knit them to fit. That’s not crazy, is it? In fact, it’s a continuation of long, knitterly tradition to re-use yarn in this way, right? I love both these sweaters, despite the size issues, and fixing them will make me LOVE these sweaters. I save money, which is of utmost importance right now. It’s completely ridiculous to spend money that I don’t have just so I can knit the same sweater again, when I love the yarns in the original sweaters and when they will be perfectly usable after a little refreshing. I have to wash these sweaters anyways, and it will take a lot less floor space if I can just hang a large hank of yarn to dry. I’m a lot better and faster knitter now. I was still having problems keeping a consistent tension when I did Hourglass, and there are mistakes in the Rogue cables and sleeve decreases that I’d like to fix. Given that both sweaters are mostly stockinette, I bet I could finish both in about a month of diligent working—just in time for the onset of true sweater weather. The kicking and screaming panic that will undoubtedly ensue when I snip the first thread and start pulling. Any thoughts? Suggestions? Advice? Straitjackets? Valium? CogKnition posted this on August 19th, 2007 @ 3:06pm in Life as a Knitter | Permalink to "What Would a Sane Knitter Do?" No advice, just a little encouragement. Rip it, baby! I was going to suggest some judicious steeking to make them the right size, but as there are knitting issues that you’d like to fix as well (gauge and cables) then rip away! If you have local knitting friends, perhaps have them come over to help? Also, if you’ve got a ball winder, frog them right into balls, and then skin the balls. Frogging and then containing the yarn leads to madness. I say do it. I will be doing some frogging and re knitting this winter also. Most are for fit issues. Bring it to the Knit Together at the Monroeville B&N Monday night and we’ll help you unravel it! A glass of (insert cocktail of choice) and let ‘er rip. 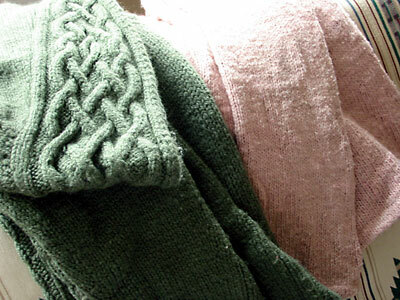 It’s cathartic and then you will have all that lovely yarn to make sweaters that fit and you’ll love even more. Rip em, rip em good.